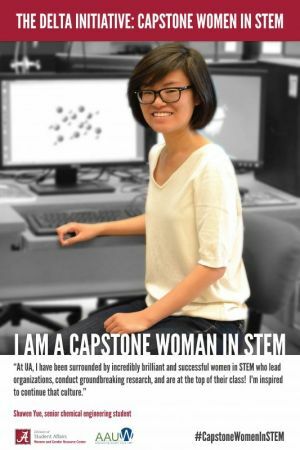 The Delta Initiative: Capstone Women in STEM is a community of freshmen women who will have the opportunity to live, learn, and study together. 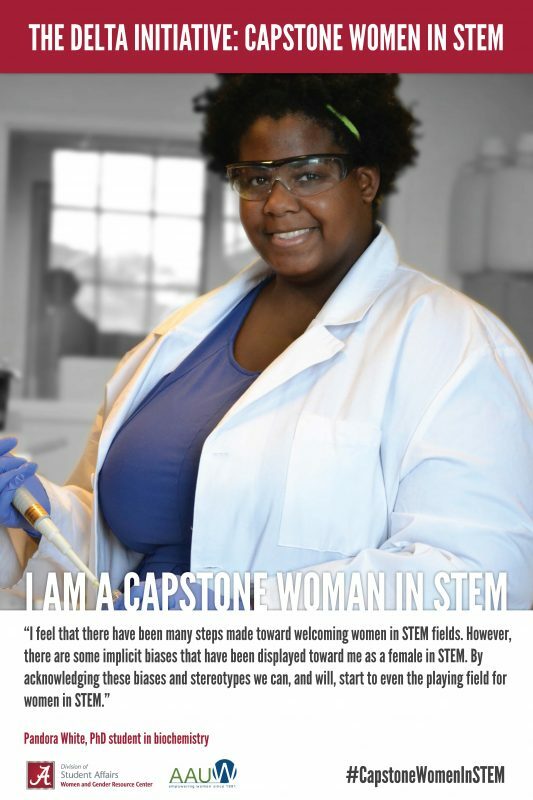 Community members will take a common Women’s Studies course, they will benefit from study spaces and programs in the residence hall that are designed with STEM majors in mind, and they will have the opportunity to participate in STEM specific community service. 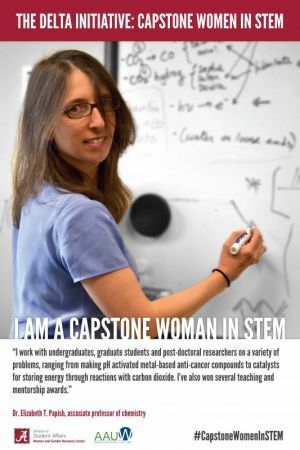 The Delta Initiative provides opportunities for career exploration, visits with STEM employers, and building meaningful connections with faculty and STEM practitioners. Students majoring in biology, chemistry, environmental science, geology, marine science, mathematics, microbiology, physics, or any major in the College of Engineering are eligible. Applications for The Delta Initiative are due by April 30 for acceptance the following Fall. 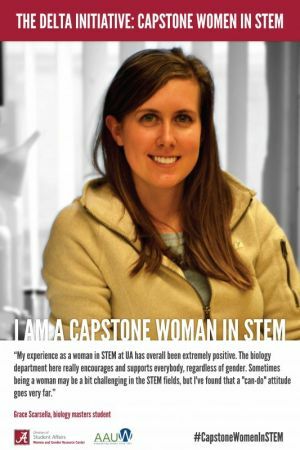 During the 2015-2016 academic year, The Women and Gender Resource Center received an AAUW Campus Action Project Grant for an awareness campaign called The Delta Initiative: Capstone Women in STEM. This print, video, and social media campaign emphasizes the importance of women’s involvement in STEM fields. 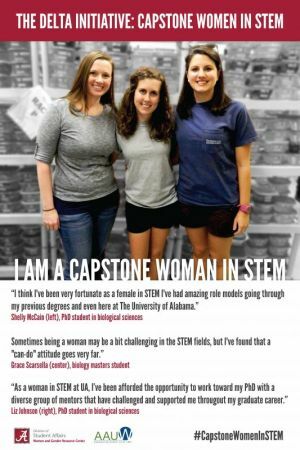 Five videos and eight posters were created to highlight the innovations and societal contributions of UA Women in science, technology, engineering, and mathematics. 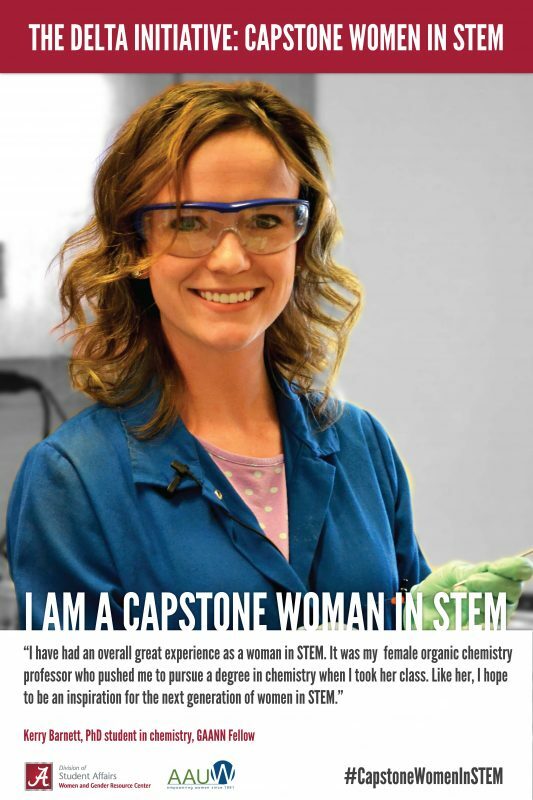 These materials are posted and shared online by all groups involved using the hashtag #CapstoneWomenInSTEM. 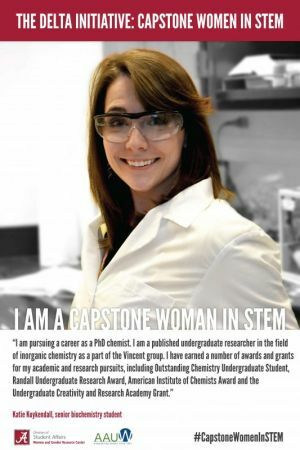 Visit our youtube channel to see the campaign videos for The Delta Initiative! For questions or event information, e-mail Jackie Northrup or Elle Shaaban-Magana or call (205) 348-0595.